Coloring hair is a transforming experience. It’s a process of reinvention that brings hair to life in a new way through chemistry–the way product formulas react with the hair. That’s why the application of hair color is both an art and a science that requires imagination, creative expression, intuition, the ability to listen and consult plus technical knowledge and skill. The combination is inspiring, and the possibilities are endless. Discover how science and nature work in complete harmony with Aveda Hair Color! 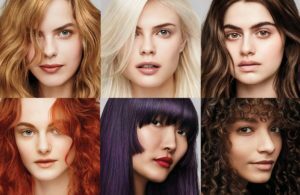 Aveda hair color provides all the benefits you love—fade-resistance, customizable shades, damage-free results, tons of condition and natural shine; and none of the things you don’t—it’s up to 97% naturally-derived! Aveda Full Spectrum Protective Permanent Crème Hair Color: delivers permanent results, lightening or darkening natural hair. Aveda Full Spectrum Deep Extra Lift and Deposit Crème Color for Dark Hair: delivers permanent results, lightening hair up to 5 levels without using bleach or darkening natural hair color, and is designed specifically for dark-haired guests. Aveda Men: 5- minute natural grey blending that enhances natural hair color or blends grey, lasting up to eight weeks and improving the condition. NEW Aveda Full Spectrum Demi+: delivers shine, versatility and speed adding tone and deposit. Aveda’s enlightener™ Powder Lightener is a protective lightener, lift while maintaining happy, healthy hair. Aveda Enlighter Blonde Finish Protective Toners: is a breakthrough in blonding that refines pre-lightened hair in just 5 minutes. It comes in three demi permanent, blonde-perfecting shades: ash, beige and gold.